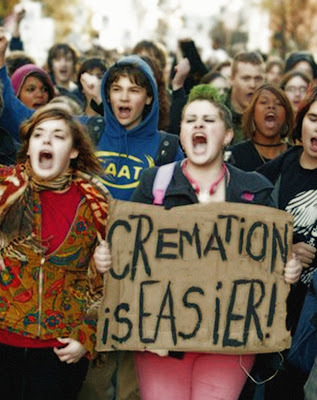 It's no secret that a lot of people hate funerals. They don't ever want to go to them and don't want one held when they die either. I understand that everyone hates a funeral because it means that someone has died, and many people tell me that they don't want one because they seem gloomy and sad, when they want to be happy and laugh. 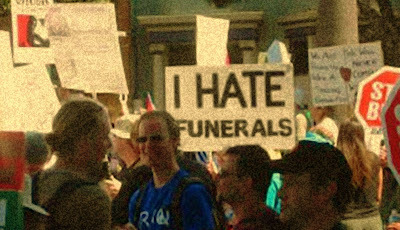 I knew there was more to it than that, though, so I started searching the Internet for posts that included the words 'I Hate Funerals'. Most of what I found were comments posted on personal blogs and online discussion forums. Included below are some comments dealing with the emotional nature of funerals that are representative of many of the posts I came across. Some of the comments surprised me, and some I'd heard many times before, but I found all of them to be a bit troubling. People seem to think that if they avoid dealing with the difficult parts of life, those aspects of life will not effect them. Many people think that if they don't cry, they won't be sad; that if they only deal with and participate in the good times, their life and legacy will be all smiles and laughter. Unfortunately for these folks, the opposite is true. If we don't allow ourselves to face the sadness and loss, to cry and comfort one another in grief, we don't move forward to a place where we can enjoy the happy memories without the ache of unresolved grief getting in the way. We are not sad because we have cried at a funeral, we cry at a funeral because we are sad. When we avoid the funeral to avoid the sadness, we are only preventing the healthy release of our emotions, and avoiding that emotional work keeps the sadness with us. If we don't support others in their time of grief and allow our friends and family to do the same for us, we don't get the full measure and benefit of our relationships, and our happy times lack the depth that a fuller relationship provides. If we ask the loved ones we will leave behind "Don't cry for me! ", we are giving advice that will hinder their happiness in the long run, not help it along. I was surprised by how many people hated funerals because they didn't think they could handle the situation emotionally. This was actually the most common type of comment. who had lost someone. And that makes me cry more than anything else. Why does this person cry so much at funerals? Well, everyone deals with their emotions differently, but a funeral is an acceptable, safe, and supportive place to cry. My guess is that if this person really does cry excessively at any funeral, there is some unresolved grief in there that needs to come out, and that dealing with this grief more, rather than less is the best course of action. This next entry is very similar. I can almost picture a giant well of emotion that is barely contained by the avoidance strategies of these people. This is no way to go through life. I will go to a funeral only if I have to drive my elderly mother. 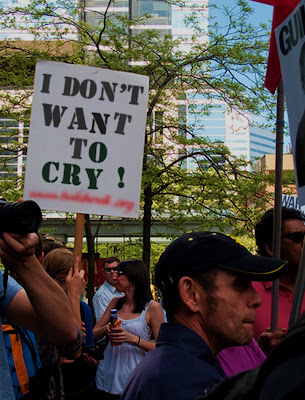 I hate funerals -mostly because I cry —even for those I don’t know. I get very emotional at funerals. I usually get out of them by volunteering to stay at the house (thieves check out obits to target the homes of those who will be attending funerals) or I prepare food for the wake at someone’s home or at the church hall. I let everyone know, a long time ago, how much I hate funerals, so they don’t expect me to attend. The last funeral I attended (other than as a driver for my mother) was my only sibling’s and I will have to go when my mother dies –but that’s it for me. My husband and I don’t want funerals or memorial celebrations, so I’m off the hook if he goes first. If I go first, he has been instructed to have me cremated, then sprinkle my ashes anywhere he wants. Some people seem to feel 'put upon' about bringing down the light hearted and upbeat nature of their day by exposing themselves to the sadness of others, or feeling it themselves. In turn they feel guilty about this, and it just adds to their negative ideas about funerals. This last piece is a particularly troubling entry from a young man who seems to believe that only laughter and smiles are acceptable in life; that if people cry at his passing, they are betraying his memory. I wonder how many people actually expect to be able to live this way, and how much of life's difficult work just remains undone in these lives. So I was in the car doing absolutely nothing with a crew when rich said listen and turned up the stereo. The words that came on hit me it said swear to god that you won't cry at my funeral. I’ve said my entire life that I don’t want anyone to cry at my funeral, but I never really told anyone. I think that it would be an insult to me. I live my life to see others happy. I get joy in seeing people laugh, so even if you are sad that I've passed on to whatever, if anything, awaits me, do your best to keep your smile up, don’t let my fading away stop you from laughing. I hate hospitals, I refuse to go to them unless I absolutely have to. It's not because there are so many people who are dying or sick that hospitals irk me it's because not a single person there has a smile on their faces. It's everything I'm not...sadness, pain, hurting, and so much more. I've never been to a funeral and will never go because I'll be the one in the crowd laughing at all the good times I've enjoyed with them. I will not cry over a death as long as I still have those memories. And I want that, not tears and sobs but tears and laughs, tears of people laughing so hard they can't help it. It is not just grieving and health issues that suffer. Relationships and a great deal of emotional growth demand facing and dealing with difficult emotional issues. I'd like to think that this comment above is just adolescence talking, but unfortunately, many adults are saying the same thing. There is denial here, and infantility. We see, perhaps, how the sensual has subverted the spiritual in an increasingly secular society. No one wants a funeral ceremony that makes a sad event sadder. But it is a big mistake to celebrate the life without, first, having acknowledged the sadness that everyone feels. The irreducible fact is that any death is exactly as sad as it is and there is nothing anyone can do to make it otherwise. Trivialising it doesn't diminish it. We have this selfsame tendency in the UK. It is deplorable. Humour has its part to play in a funeral, of course it does, but not as a coverup for sadness. Jokes cannot displace sadness or paper over it. Real humour is different. It bubbles up through stories about the life of the person who has died. Real humour not only makes people laugh but also points up the poignancy of the occasion. There is a high emotional price to be paid for failing to engage seriously and thoughtfullly and, yes, unselfishly. "It's everything I'm not...sadness, pain, hurting, and so much more." Very strange stuff. I think of myself as happy, but life is filled with ends of things and loss and - well, recognizing a huge loss such as the loss of a human life seems pretty normal and healthy. To me, all of this is about avoiding our own mortality and that is understandable, to a certain extent. But many take it very far- too far. Outstanding piece, Patrick. Thank you. I always thought that I had a rather odd family. The Yankee side never holds funerals or memorials. When someone dies, my mother's father and mother for example we did nothing. Gran's body was sent to Harvard as a science cadaver (per her wish) and when her ashes were returned a year later she kicked around in a cardboard box for several years before we finally decided to bring her to Vermont to bury ashes with her family. Consequently I never know how to behave or act at a funeral since it was never something I attended while growing up. I am sure the legacy will continue when someday it is my mother. give me the st. james infirmary. bona fide New Orleans funerary. but i'll have one of those. more peaceful than museums even. Blessing for me I worked in Venice, Italy - I was at an expatriates grave, a very famous man. russian writer? being the living dead was never on my to-do list. I am a one of those who cry and whoever’s funeral, i cant help it if I’m not crying i am looking for distractions to disconnect me, what i do love is hearing the amzing stories that make me laugh and smile and then somwhowwhen i cry its happy tears and thats all ok! God knows why i went into setting up a business in funerals! Not one photo slideshow goes out of our office without one of my tears on it!